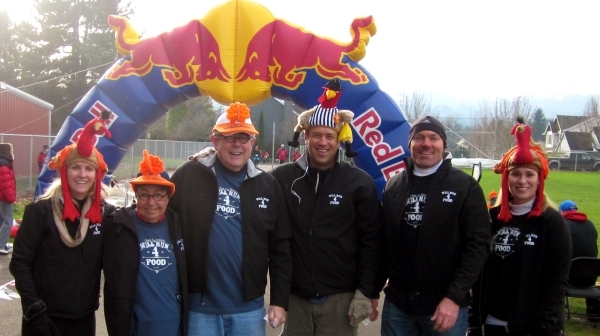 "The Sherwood Give n' Gobble has become one of Oregon's premiere Thanksgiving Day's turkey trots...The Give n' Gobble is such an amazing community event. The race truly consumes Sherwood. You are running through neighborhoods where the community greets you on their doorsteps as you run by. This is awesome!" ...Why you should Give N' Gobble! from the in-laws all day. your Stretchy Pants this year. with to get out of kitchen duty. #1. Because it's fun and a good thing to do! 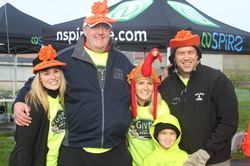 In 2007 Cindy Aggson, owner of Carpe Viam Marketing and avid runner, launched the first annual Give n' Gobble. Her goal was at least 100 participants, but to her surprise over 500 runners and walkers came out to support the new Thanksgiving Day event. "I had been hoping to put a community run together for a few years because there are so many runners and walkers who go out on Thanksgiving rain or shine. I thought it would be wonderful to all run or walk together for a good cause. This seemed like the perfect year to start a new tradition," said Aggson. Years later over 3,000 participants, volunteers and spectators embrace the sold-out event as an honored Thanksgiving tradition and the Give n' Gobble team has grown to not only include Aggson's husband and their three sons, but also many local families, business owners... and an army of over 150 volunteers each year. Many local families now consider the Give n' Gobble "a mandatory family tradition" before their big Thanksgiving meal. One local grandpa was quoted saying (with a big grin on his face) "If they don't participate in the Give n' Gobble they don't get any turkey...it's that important to us!" Thanks to the funds raised with the Give n' Gobble, in 2011 Helping Hands launched their "Backpacks for Kids" program is designed for children who do not have access to nutritional meals at home over the weekend. Each week volunteers pack over 100 backpacks full of simple nutritional food that will last these elementary school children the entire weekend. To date these hard-working volunteers have packed over 50,000 nutritious meals for kids. "For many kids in the schools' free or reduced meal program, that school lunch is possibly the only meal they get during the day," says Gerry Edy, Helping Hands co-director. "Our goal is to make sure no child in our area goes to bed hungry" says Edy. The "Backpack for Kids" program is a true community effort as Rotary Club members pack backpacks for Middleton and Edy Ridge students and residents at Cedar Creek Assisted Living pack backpacks for Hopkins and Archer Glen participants. The money raised by the Give n' Gobble Run/Walk funds Helping Hands' annual expenses and making this new backpack program possible.